Milk doesn't do your pet's body good. 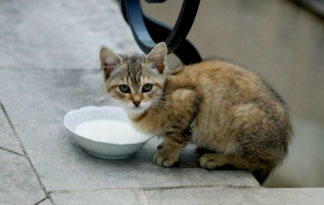 The image of a cat lapping at a saucer of milk is certainly a familiar one, but in reality, that bowl can spell trouble. While a glass of cold milk can do your body good, the same can't be said for your pets. Neither cats nor dogs come equipped with systems that inherently carry enough lactase (the enzyme that helps break down lactose). As a result, introducing cow's milk or milk-based products like ice cream into their diets can lead to digestive issues including upset stomach and diarrhea, or even food allergies. Follow the advice of organizations such as the Humane Society of the United States and keep your pet on a lactose-free path. Or seek out commercially prepared milk substitutes created especially for cats, which can be found at your local pet shop.